Take your rightful place in online business listings. 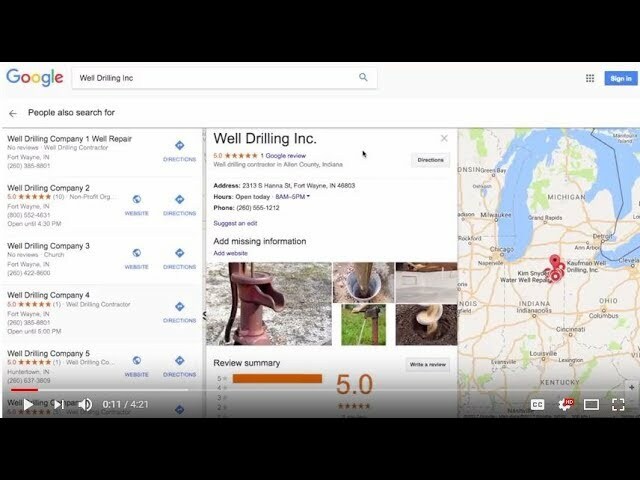 Our Online Directory Listing service will pull information from your Key Dealer profile to assist you in creating a Google My Business profile, putting your business listing in the running with the most respected names in the well drilling industry. Google My Business lets you manage your online presence across Google, including Search and Maps. By verifying your business information, you can both help customers find you and tell them the story of your business. Verify your Key Dealer profile. Fill in as many details as you can to provide information we can use to fill in your profiles. This includes your business logo and photos, as well as basic information like your address and customer service contact information. Enter your payment information. It’s as simple as a credit card transaction – we’ll charge your card for the one-time setup fee and send you a receipt and further instructions by email. Create or Sign In to your Google Account, add your business and grant us access to edit your profile. Don’t worry, we’ll tell you how! In just a few quick clicks, you’ll have complete control of your profile and we’ll be able to populate it for you – the best of both worlds. How much does it cost? $250, one-time setup fee to Ferguson Advertising. How long does it take? If you’ve already verified your Key Dealer profile, it will only take a minute to purchase the Online Directories service. If not, it may take up to 10 minutes to complete. When your part is done, we’ll start the process within 3 business days. There is no ongoing maintenance – once your profile is set up, you’re done. If ever you need to change information in your listing, simply log into your Key Dealer portal and edit your profile information. We will sign you up for the Well Drilling Contractor business category. Don’t let valuable business opportunities pass you by. Get started today!